The Prabodhini Ekadashi (Kartik sud ekadashi) is when the chaturmas comes to an end. This is the first ekadashi after the Diwali festival. The day is also referred to as the prabodhini ekadashi. Prabodh means to awaken. This is the day that the Lord (Dev) is said to arise from his 4-month sleep. It is therefore sometimes also referred to as Dev Prabodhini Ekadashi. Again, because the Lord awakens, this day is also called the Dev Oothi (wake-up) ekadashi. The sentiments for the Lord's disciples behind this day go further. We have to remain vigilant that from this day, the Lord within us also arises, i.e. the divinity of the Lord is present and rejuvenated within us. During the chaturmas period, the wandering preachers would have remained resident at one place. But by now, the monsoon rains would have ended. The climate would have become such that the wandering preachers are able to resume their travels. So they will give up the place where they were living for the chaturmas and start preaching and providing spiritual guidance to the people. The extra observances taken by all disciples conclude on this day. Thus, the Kartik sud ekadashi is considered the most important ekadashi of the year. Celebrations last for 5 days; ending on the poonam (full moon day). This poonam is also called Dev Diwali. For disciples of Shree Swaminarayan Gadi, the day has an even greater significance as six great historical events occurred on this day. In the year Samvat 1796, Lord Swaminarayan's father, Dharmadev was born in the village of Itar. In the year Samvat 1857 in the village of Piplana, Sadguru Shree Ramanand Swami initiated Shree Nilkanthvarni, Lord Swaminarayan as a Sant, and named Him Shree Sahajanand Swami, and Shree Narayan Muni. In Samvat 1858, Sadguru Shree Ramanand Swami handed over the entire helm of the religion to Shree Sahajanand Swami Maharaj, Lord Swaminarayan. This historic event occurred in the village of Jetpur. From the moment He took control of the religion, Lord Swaminarayan also became seated upon His divine throne, Shree Swaminarayan Gadi. 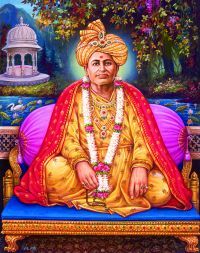 The divine murti through whom Lord Swaminarayan re-manifested upon this earth to propagate His own true spiritual tenets, Jeevanpran Shree Abji Bapashree, gave darshan upon this earth today in the year Samvat 1901 in the village of Vrushpur. The divine spirituality, Jeevanpran Shree Muktajeevan Swamibapa, who spread the supreme tenets of Lord Swaminarayan and Jeevanpran Bapashree throughout the entire world; the revolutionary divine Saint who brought from the celestial abode Akshardham, Shree Swaminarayan Gadi, onto this earth, took initiation as a Sant from His gurudev Sadguru Shree Ishwarcharan Swamibapa on this day in the year Samvat 1986 in Saraspur, Ahmedabad. Due to the significance of this day, a 24-hour continuous dhoon is held at the headquarters of the Karan Satsang, Shree Swaminarayan Temple, Maninagar, in the presence of His Divine Holiness Acharya Swamishree. Continuous dhoon is also held for shorter periods of time at all Swaminarayan Gadi Temples around the world.